Born in 1973 in Groningen, the Netherlands, (Marie) Paul studied at the Minerva School of Fine Arts in the same city, where he specialized in lithography and drawing. On completing his degree in 1998, his work was nominated for the Hendrik de Vries Stipendium. In 1999, he was commissioned to create a series of sculptures for the central garden of the Academic Hospital of Groningen. Since then, his interests have shifted towards painting, and in 2004 a collection of his work was exhibited at the Horst-Janssen-Museum in Oldenburg, Germany. Exploring de psychology of his subjects, using both realism and symbolism, de Bie’s early work reminds us of the frozen precision of medieval painting or new-realist movements of the early 20th century. Lately there has been a clear change towards portraying and a more expressive way of painting. Paul worked in Paris, Antwerp and in Barcelona. He is currently working in his home town where he started making official portraits for the 400 year old University-gallery. 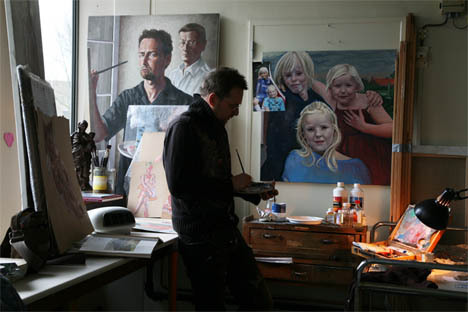 In 2013 he was seen in the painting- competition ‘Sterren op het Doek’ on national TV, making a portrait of dutch actress Ellen Vogel. In 2016, his painting ‘Sabina’s room’ wins the Public Prize of TV-show AVRO’s Kunstuur and is exhibited twice in Museum de Fundatie in Zwolle that summer.